This knife set from Elite Force is perfect for the avid outdoors explorer as it contains everything anyone would need when out on a hike, camp, or any other outdoor adventure. 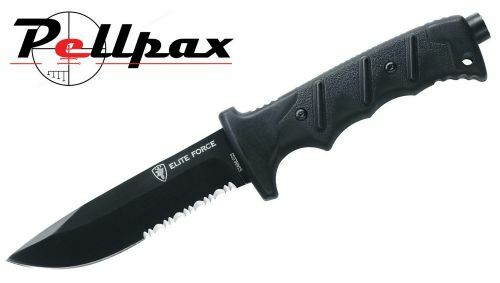 The knife consists of a sharp and strong blade made from 440 Stainless Steel which is finished in a matt black coating. A partial serration assists in cutting through tough materials, and the polymer handles are screw into the blade itself for a full tang construction. As well as the knife the kit comes with a sheath which attaches to a thigh pouch, which also has space for a fire starter with honing surface, and a handy belt cutter made from stainless steel which also stores in the pouch. Add this item to your basket & spend an extra £460.01 to apply for finance.